Maybe you are in the same situation as I’m in: I’m using action cameras as well as my mirrorless camera, the Sony a6300. And sometimes I only take my Smartphone for a quick video. 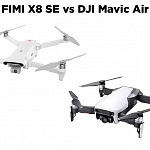 So which gimbal to choose? 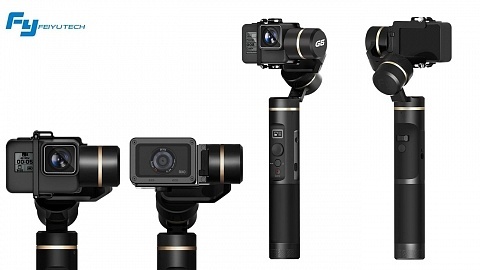 There are many DSLR gimbals, but they are way to large for an action cam or Smartphone (their weight is too light to mount). And then there are Smartphone and/or Action Camera gimbals, but they can’t carry a mirrorless camera! Feiyu finally tackled and introduced Feiyu G6 Plus, a gimbal for all of them! In general gimbal stabilizers became my most favorite camera gear, as they not only provide smooth, non-shaky and therefore professional looking videos. They also replace other camera gear (up to a certain point), most of all a steadicam, but also a dolly, jib or rig. Great that there is finally one gimbal I can use for most of my equipment! Feiyu G6 Plus itself is about 33cm high and weighs 663g (without battery). The payload 800g (!) if the camera is well balanced. 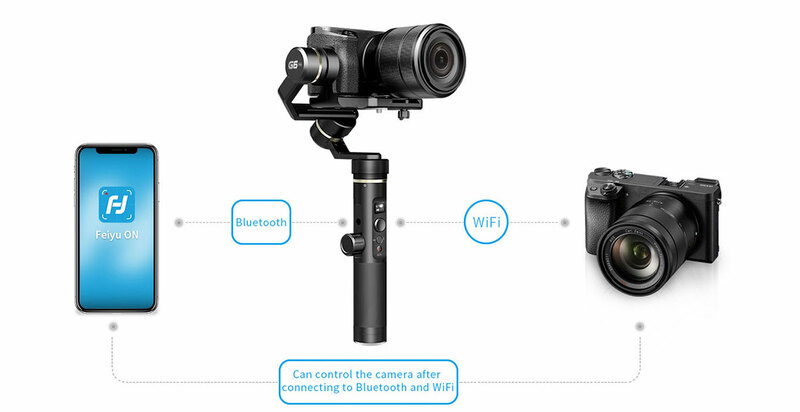 The 3-axis Feiyu G6 Plus is a handheld gimbal where the grip holds the removable batteries. The 26650 type 5000 mAh capacity battery should last for about 12hrs of operation. On the pan axis Feiyu G6 Plus offers unlimited 360° rotation whereas roll axis is limited to 320° rotation and tilt axis is limited to 260° rotation. The camera’s height is recommended not to exceed 70mm, otherwise the camera might hit the gimbal while it is working. Feiyu G6 Plus offers wifi and Bluetooth to connect with camera and smartphone. To use your Smartphone as camera you need to download Feiyu Vicool App, to control the camera or gimbal you need to use Feiyu ON app. Both are available for iOS and Android. The body of Feiyu G6 Plus is splashproof . 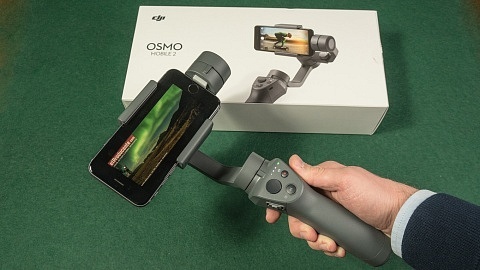 The grip holds a OLED display that shows the parameters of gimbal and camera such as current operating mode, battery level, Bluetooth connectivity, etc. On the front it offers a shutter & function button as well as a joystick to control the gimbal’s head. On one side there’s a settings button and on the back side a trigger button to lock all axes as well as a button to adjust horizontal alignment (levelling the camera). On the side there is a multifunctional know ring. It is either used to fine-tune the camera position. You can control each axis separately to level your camera. And it can also be used to control zoom or focus of the camera as well as to select the camera’s setting (depending on compatibility with the camera). For mounting there are 2 1/4″ standard tripod threads: One on the bottom and one on the side of the grip. And there’s a USB port for charging the gimbal. Another great addition is the built in tripod plate, great to quickly mount/dismantle the camera from the gimbal. Btw. a GoPro mount is included as well! The basic modes are Panning Mode (default mode), Locking Mode and Follow Mode. The roll and tilt directions are fixed and the camera moves according to the left-right movements of the user’s hand. All axes are locked and the orientation of the camera is fixed however you move the gimbal. Only the roll direction is fixed and the camera moves according to the left-right as well as up-down movements of the user’s hand. By pressing the function button once you can switch between panning and locking mode, double press for locking mode. 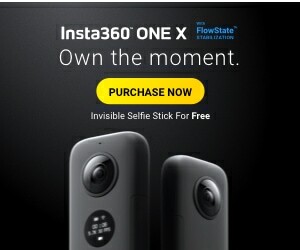 Pressing the button 3 times turns the camera 180°. Officially this mode is called auto rotation mode, but I call it time-lapse mode. This mode can be used to create stunning time-lapse where the camera is moving. 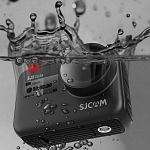 Press the function button 4 times and move the camera into its start position. Simply grad the camera, point it in the desired position and hold for a second until the gimbal locks this position. Now press the button once again and move the camera into its end position. When you press the button again the gimbal returns into its start position and slowly moves into its end position. You can define the speed using Feiyu’s ON App from 9 seconds/turn up to 8 hours per turn. Other gimbals are often limited to certain action camera models, as you have to place them in a frame. Great thing about Feiyu G6 Plus is that you are fully flexible. 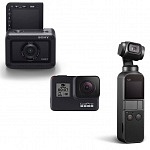 You can use any type of action camera, also the ones with a different form factor like Sony FDR-X3000 or Sony RX0. 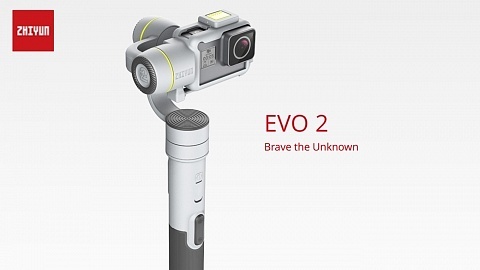 Of course popular action cams such as GoPro Hero6 & Hero5 as well as Yi Action Cameras work with this gimbal. You also got the option the use them within an underwater case. Remember Feiyu G6 Plus is splashproof. Another issue with several other gimbals is the visibility of the touchscreen. 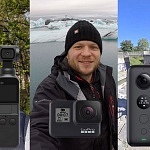 Many of my Smartphone gimbals don’t allow the use of the action camera’s touchscreen. 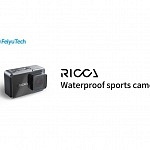 With Feiyu G6 (the action camera gimbal) you have access to the screen, but you can only use a limited set of action cameras. G6 Plus gives full visibility and operational use of the touchscreen of any action camera brand. When using the optional smartphone clamp, you can mount any smartphone with a phone width of 57 – 84mm. Personally I would go for a more compact solution for JUST a smartphone (like Feiyu SPG or Feiyu Vimble 2). 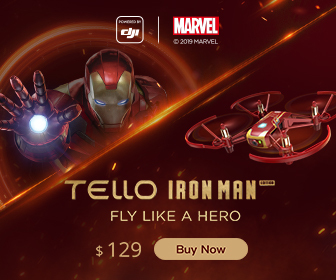 But if you are planning to use any other type of camera with your gimbal, such as compact, mirrorless or action camera, I would go for Feiyu G6 Plus. I previously used Zhiyun Crane-M as my Sony a6300 gimbal. But I was limited to a certain set of lenses as the max. payload of Crane-M is just 650g. Feiyu G6 Plus gives me a more options as the payload is 800g! Here’s a comparison of my Sony a6300 (with battery and SD card inserted) and various lenses: Sony 20mm, 35mm and 16-70mm. They are all below the payload limit of Feiyu G6 plus. 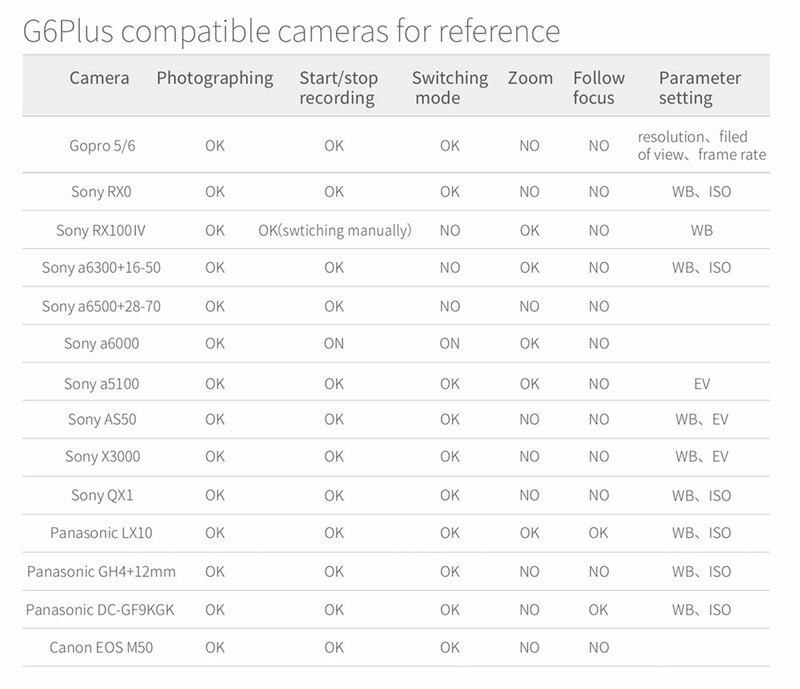 Furthermore G6 Plus is not heavier or larger compared to Crane-M.
Of course you can use many other types of cameras: Sony RX100 series, Sony a6500, Canon M50, Canon G3X, Panasonic LX10, Panasonic GH5 and GH4 to name a few. Another great feature of Feiyu G6 Plus (compared to Zhiyun Crane-M) is the sliding adapter plate. This way you can attach and detach the camera quickly. With Crane-M the camera was screwed straight to the gimbal. Feiyu G6 Plus is the gimbal I’ve been waiting for. I used Zhiyun Crane-M for my Sony a6300 but I was limited to certain lenses. With Feiyu G6 Plus I can use any of them. And I don’t have to think about which gimbal to take and which camera I might be using. I can use any of my action cameras and still have a fully visible and operational touch display. Or I just go with my smartphone – G6 Plus – my new all in one gimbal solution!